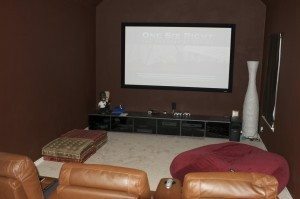 Have you ever thought about converting that extra room into a home theater room or doing the same with part of the basement or attic? It’s not like the room has to be rebuilt from scratch or needs movie house chairs, a slanted floor, a projector popping out of the ceiling, or little blue hued LED lights marking an aisle. 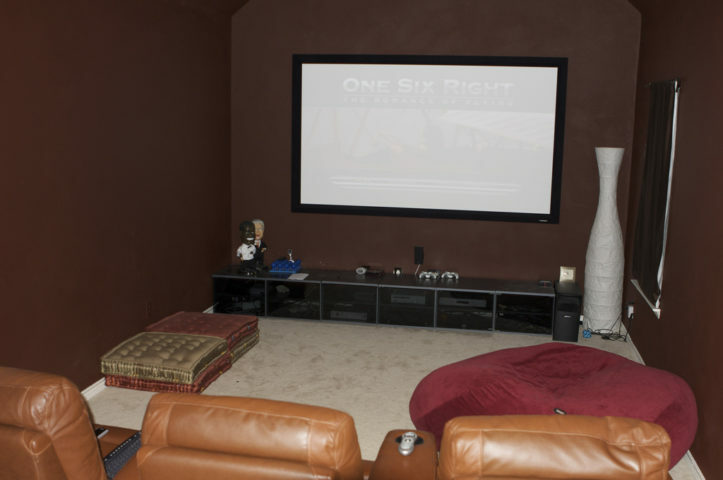 Sure, you may need a carpenter or local handyman for a few things, but for the most part home theater rooms can be the ultimate viewing spaces created on a simple budget where family and friends settle in watching great films without having to go far. After a short while, that odd room will quickly turn into a cozy place to hide away on cold nights during the winter or sizzling days in the summer. Whether it’s a couch, recliner, or bean bag, the first thing every home theater room needs is relaxing places to sit. After all, you’ll likely be off your feet for most of the show. Even if you decide to go all out mimicking a commercial theater by setting up the room with chairs and aisles, make sure there’s enough room to stretch and slouch down if necessary. This is your home theater we’re talking about, so installing a 20-inch screen just won’t cut it. The minimum screen length should be 100 inches, and it should be positioned well at the front of the room without obstructions. We’ve all been to movie houses where the sound resonated badly. Now that technology has made such amazing strides, your home theater’s acoustics can provide breathtaking audio. Research speakers and subwoofers so you can attain optimum sound quality and better understand speaker placement. When sitting down to watch a movie and relax, you don’t want outside disturbances to ruin the fun. You also don’t want to disturb others around the house who may want it a little quieter. That’s why soundproofing the theater room — or at least setting up something to buffer potential noise — will benefit everyone. When a room like a home theater with no open windows is soundproofed, there’s little natural circulation. That’s why an internal heating and air-conditioning system (HVAC) with temperature control adds additional comfort, distributing the flow of air evenly when a movie is in session. In most commercial movie theaters you’ll notice walls have curtains or are painted dark colors. This prevents screen light from reflecting off the surroundings. Use similar methods to curb light reflection in your home theater, keeping in mind things like picture frames may cause similar distractions. Carpeting in a home theater room comes in handy when a large group is present, as a carpeted floor can provide extra seating. More importantly, unlike other materials it also helps absorb sound and light instead of reflecting it when a movie is being shown. Nevertheless, carpets should be low (so they don’t attract extra dust) and made from easy to clean material. The kitchen may only be a few steps away, but having a small fridge in the theater room allows you to refill a drink without having to press pause. Just make sure the appliance makes little noise and won’t leak any moisture. While your home theater is sure to have an overhead light, installing a dimmer gives you options. It can be made brighter when cleaning or fainter when reading a review or referencing the book of a film being watched. Finally, when putting the finishing touches on the home theater room, keep it simple by not going overboard on decorations and tchotchokes. You want the room to be as uncluttered and clear as possible, as the less stuff there is the easier it will be to upkeep. I’m a home improvement journalist. I blog about a broad range of eco-friendly topics including DIY home remodeling, cleaning tips, frugal living, as well as unique landscaping and gardening ideas.